Actually, it was the second film, Bridget Jones: The Edge of Reason. I was watching this movie the other night and passed out with about 40ish minutes left. Of course I could not leave it unfinished.. So I watched from about that point onwards the next afternoon. In one of the scenes (where Bridget finds out she will be working with Daniel on his TV show...) she is wearing a light blue blouse with either black or brown dots and some peachy-pink dots. I instantly knew I wanted to paint that on my nails. I was rather annoyed that during the painting process - well, just before I was getting ready to apply top coat.. That there was some cotton fluff attached to a dot on my index finger. Of course I grabbed it and of course it would drag across the brown and ruin my night. Ohhh well!! I still really loved how this turned out! I also really liked all the colours together!! I used: OPI What's With The Cattitude?, Essie Little Brown Dress, Color Club Pardon My French (I think) and a dotting tool which was provided by Born Pretty. 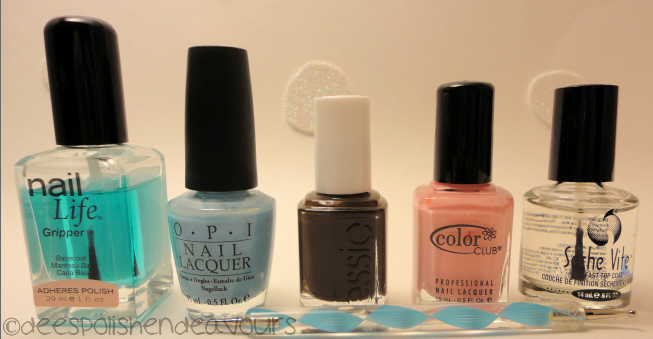 I should really make little labels for my Color Club polishes.. They came in a set and are not labeled on the bottle. Kind of annoying as I also have to look back to see what they are called!! Well, I am off to go paint my nails with the franken polish I made for the contest over at More Nail Polish - if you haven't seen it, go check it out! You have until June 2nd to enter.. Plus, as this is technically my third (I basically made the same colour on my first and second tries.. Anyways..) - it was nice to have a reason to do some frankening! I hope everyone is having a great Tuesday.. I have been cleaning. all. day! It does go really nicely together! That's a very cute design, and the colors are great together! 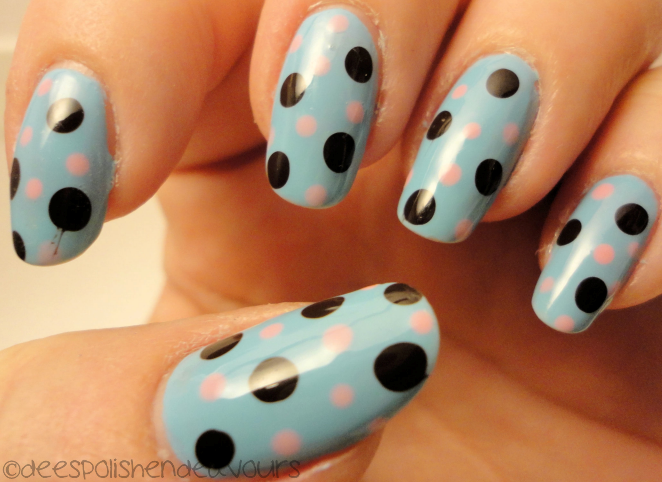 I Simply love this nail-style!! wow! !